The ocean to you! We fly fish in daily from both coast & the Gulf! Our building hosts a FRESH FISH MARKET, a RESTAURANT and a RAW/SUSHI BAR. The boats that supply our fish, crabs and lobsters go out each day. That day’s catch is in route to Bentonville within 10 to 12 hours after it comes out of the water! Come enjoy the FRESHEST FISH in NWA! Your place or ours. We will make your event special with the freshest seafood in the area. We offer options for non-seafood eaters as well as vegetarian & gluten free items. Live bands in the patio are posted in facebook (https://www.facebook.com/BluFishMarketplace). 1.5 hours to get the food. Ordered sashimi, got sushi roll instead. paid cash tip and charged the ticket to my credit card only to find that they added an extra $20 to the charge. slow, wrong, and dishonest, I would not recommend my enemies to eat here. Update: they refunded the $20. Great food! Service was good, a little disappointed how quickly entree followed appetizer. Could not finish quickly enough before entree was served. Had the lobster bisque, fish and cups, grilled salmon, salad, hush puppies, and pineapple slaw. Topped it off with key lime pie in a mason jar. Everything was delicious-would return here. Very casual dining. Ate here for the second time, last Friday. The food is amazing and some of, if not the best seafood you can find in the area. Will definitely be going back several times. If I had a complaint, it would be that it's pretty busy, but if it wasn't, what would that say about the food. Great Seafood. A little hard to find but well worth the effort! Try the Sangria - it's AWESOME! The food was phenomenal!!! My husband, son, and I all loved it. And the food is priced well too. Best seafood we have had in NWA. Great place for casual dining - specializes in VERY fresh seafood flown in regularly from the East Coast. Fresh seafood market adjoins restaurant. Minimalist decor - wooden picnic tables for seating, and metal trays used for serving some dishes. We had fish and chips. Fish was red snapper - should have asked them to substitute cod for firmer texture on fish. Will definitely go back to try other items on their menu. This review is probably unfair since I grew up and have lived on the coast of the Mediterranean Sea and the Gulf of Texas and Florida and traveled to other coastal regions and have had great, fresh seafood. There was no wait even though we had reservations. Staff and servers were exceptional. Those are the positives. Food was disappointing and overpriced. My wife and I shared a California roll and fresh fish. The roll was not prepped properly being filled with mostly rice and the fun ingredients were about the diameter of a US dime. Fish was just OK. The hushpuppies were some of the worst I have ever tasted. I asked kindly about them and our server said it was their own recipe. They were also undercooked. The best part of the meal was the french fries which were hand cut. Our friends split a fried platter of something and gave it an average grade. We ask to sit at a table and the chairs were basically lawn chairs. The reason we did was because the "booths" were actually picnic tables. That leads me to conclude with this, the prices for the food in my experience and the seating were very much over priced. I would expect at least a 35% less for prices across the board. It would have cost us less money for better food to eat at Fish City or the like. This was like eating at a seafood diner. But, being 660 miles inland...it is difficult to get caught that day goodies from the sea in NW Arkansas. I will not go back and urge any of you who enjoy good food and nice seating to do the same. I write a lot of reviews for various companies, restaurants, and online retailers. This is my first negative review in a long time. Peace to all! No one told us the sushi chef only works certain days. Super disappointing. The food was good, though pricey for lunch and options were extremely limited. The restaurant itself is cold and warehouse-like - and doesn't seem to warrant the high lunch prices. This was our second trip. The food was good, the service was excellent and it is a little bit different. We look forward to crayfish season! The fish at Blu is always exceptional. I eat here once every time I am in town. The specials are usually very tasty sounding and hard to pick from. We were very happy to see a restaurant devoted to fish open in Bentonville. Very much liked the hip space and broad menu. The server was very friendly. I would have liked more crab and fewer breadcrumbs in the crab cake. The tacos were tasty and the portions nicely sized. Very expensive for the atmosphere. Waitress looked liked she just crawled out bed. Hostess was sitting all the time on her cell phone looking at facebook , most likely. Restraunt not the cleanest. You sit at picnic tables. For the price of the fish, only one piece of fish given ,but they do load you up with homemade fries. Would not go back again. I ate alone at the bar which allowed me to chat with my server, the owner, his sister and the sushi chef. So nice not to be isolated at a table. I had a good fish n chips dinner but next time I'll order a dragon roll. I had no idea the sushi would be so good. I was warmly welcomed and treated like family. The portion sizes were very nice. The service was good. We were not sure what to expect when we showed up but it was very nice. 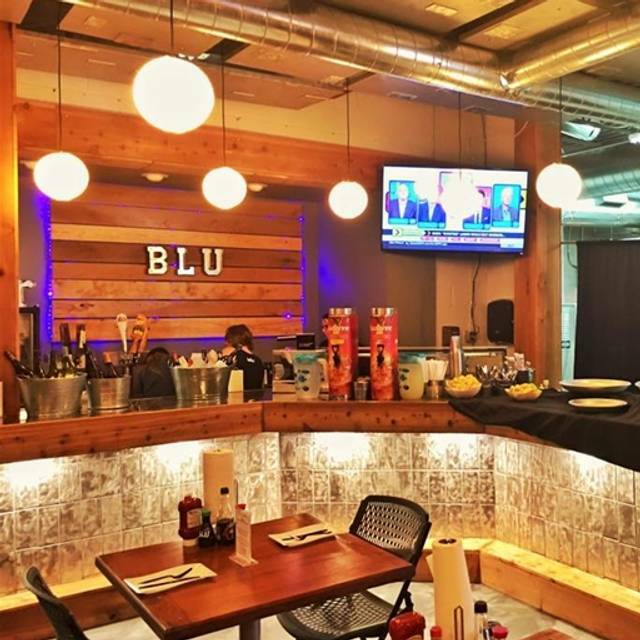 No fish at BLU. Saturday at 6:30pm and almost all fish types were not available when we ordered. Others disappeared after we ordered them, so had to change to our third or fourth choices. Tap was broken for local beers. Sushi chef was apparently an hour behind on orders. When food did arrive it was competently prepared, not great, maybe above average. Service was amateurish and the management, while helpful, was not especially apologetic and did not offer to comp any of our bill -- which really should have been done under the circumstances. To their credit, they did not serve bad fish, or frozen, or make other compromises -- they just didn't serve. Great overall experience! The shrimp, salmon and catfish was not only fresh but was cook to perfection. Good casual seafood restaurant but somewhat pricey. The restaurant did NOT honor our reservation. They indicated that they have problems with Open Table. Found seating outside, ok. They were out of everything that we wanted. It was a Saturday night and the fresh seafood is delivered early in the week. When they're out they're out. Very, very limited menu. The scallops we had were good. The grouper not so much. Best fresh seafood in town, AWESOME as Always !!!! Best seafood in our area ! Will go again and again! So many great things to try! Ordered Sea Bass on special, it was overly spiced for such a delicate fish and it was also overcooked. Disappointed. Ran out of the beer i was drinking (after one bottle) and i was told the manager/owner(?) forgot to pick some up. Expensive for what it was. Doubt I'll go back. Possibly the worst place I have eaten. The service was horrible. Slow and appetizers did not come till after my mean came which was cold. The waitress did not seem to care what was going on. I would not recommend this place to anyone. Over priced and poor quality. Also the first three things we ordered you were out of. Our appetizer and entrees were excellent. Our waitress was most helpful when we asked for suggestions and were ideas were great. The down side was they were unable to serve wine due to being late in renewing their liquor license.